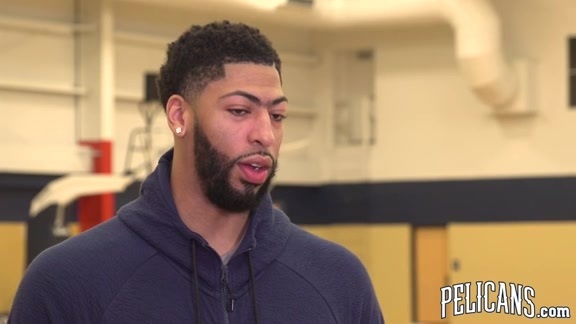 They play in the NBA’s smallest television market, but headlined by an MVP candidate – who’s also one of the league’s most exciting players – the New Orleans Pelicans will frequently appear on the national TV airwaves in 2018-19. Partly as a result of a scorching-hot second half and the franchise’s deepest playoff advancement in a decade, the Pelicans are scheduled to make a combined 13 appearances this season on ABC, ESPN and TNT, tying a franchise record. There’s a clear correlation between the win column for New Orleans and the willingness of TV network executives to feature the Pelicans in prime-time games. This is the third time in team history that the Pelicans have earned exactly 13 scheduled games on the league’s marquee broadcast stations, with the previous instances coming off a franchise-best 56-win campaign in 2007-08, as well as the club’s first playoff appearance with Anthony Davis in 2014-15. In an acknowledgement of how entertaining and competitive the Western Conference should be in ’18-19, a dozen of NOLA’s 13 national TV appearances this season will be intraconference matchups (the lone exception is March 12 vs. Milwaukee on TNT). Included among the 12 West contests on national TV are both trips to Houston, both visits to Portland, both road games against the Lakers in Staples Center and both home games vs. Oklahoma City. There are also two matchups vs. Minnesota (one at Target Center, the other in the Smoothie King Center) and road games at Golden State and Memphis. The Pelicans have started virtually every recent season in mediocre or poor fashion, partly due to challenging early slates that have often included heavy doses of Golden State. New Orleans has been such a notoriously slow starter out of the gate that last season’s 6-6 record through 12 games actually represented a dramatic improvement, when compared to 1-11 and 2-10 records, respectively, to open the previous two campaigns. The only time during Davis’ six-year career that New Orleans has been over .500 through a dozen games was ’14-15, when the Pelicans were 7-5, but they were 3-9 in the Kentucky product’s rookie year. On paper this time, New Orleans would seem to have a better chance at not digging itself an early hole. Although the Pelicans open the regular season in Houston against the league’s best team record-wise from ’17-18, the next four New Orleans games are all in the Smoothie King Center, with three straight vs. lottery teams. Granted, that stretch is followed immediately by an extremely daunting five-game road trip (Denver, Golden State, Portland, San Antonio, Oklahoma City). Of the Pelicans’ first 12 home games through the end of November, only three are against teams that made the playoffs last season (Utah, San Antonio, Boston). Near the back end of the 82-game docket, New Orleans has an extremely favorable itinerary travel-wise, including a 13-game span from March 5 through April 3 that features 10 home games. Over that 30-day period of the calendar, the Pelicans will only spend six days on the road, never venturing further from the Crescent City than a 550-mile trip to Orlando (there are also games in relatively nearby cities Dallas and Atlanta). For the second straight year, the NBA has moved up the start of the regular season by one week to mid-October, which has greatly aided the league’s efforts to reduce back-to-back games and the fatigue or diminished sleep that can come with them. The Pelicans will benefit significantly again in ’18-19, with only 13 back-to-backs on their schedule (earlier this decade, it was common for them to play 20-plus each season). This is the second straight season that New Orleans is scheduled to play exactly 13 back-to-backs, but this time, only nine of those occurrences require the Pelicans to travel, because four instances are home/home back-to-backs in the Smoothie King Center. New Orleans opting to schedule multiple home/home back-to-backs is a relatively new development that the team has experimented with in recent seasons, with generally favorable results in terms of fan support. For example, the Pelicans hosted Dallas and New York on the weekend between Christmas and New Year’s Eve last season and drew near-capacity crowds for each game. In March, a scheduled home/home back-to-back vs. Houston and Boston garnered two sellout audiences of 18,000-plus fans. In ’18-19, all four Pelicans home/home back-to-backs are Friday/Saturday setups, highlighted by a Texas weekend Dec. 28-29 against Dallas and Houston. The club’s fourth and fifth overall games of the regular season are on Oct. 26-27 vs. Brooklyn and Utah. For logistical reasons in downtown New Orleans, the Pelicans always vacate the Big Easy during the culmination of the city’s annual celebration (Fat Tuesday is March 5 in 2019). As a result, they have a four-game West excursion that begins Feb. 27 at the Lakers and continues with games in Phoenix (March 1), Denver (March 2) and Utah (March 4). The squad’s return flight to Louisiana from Salt Lake City will land in the wee hours of the morning March 5, in time to catch at least a portion of Fat Tuesday festivities. Due to the annual Bayou Classic between Grambling and Southern in the Superdome, the Pelicans also will always be on the road during the weekend after Thanksgiving. This year they have a three-game East trip that begins in Philadelphia on Thanksgiving Eve, followed by games that weekend at New York and Washington (incidentally, the local NFL team, the New Orleans Saints, host the Atlanta Falcons on Thanksgiving night). The presence of the Saints also means that the Pelicans can’t play home games during potential NFC home playoff dates in January, which this season include Jan. 5-6, Jan. 12-13 and Jan. 20. The Pels have games in Cleveland and Minnesota on the first two Saturdays of that month, but don’t play on the third weekend.